As I'm sure most of you have picked up by now, face-melting electronic dance music isn't really my interest or forte anymore, but that doesn't mean that the whole genre of rave-inducing anthems isn't still in my blood and something that, from time to time, I genuinely appreciate. Additionally, as with any popular form of artistic expression, there is always room for the trend-followers, copycats, or fakes to coexist with the merited geniuses or innovators. While East Germany by way of Ukraine's France's Vitalic churns out fist-pumpers that neon-clad hipsters are likely to fawn over, he distinctly falls in the latter category, and therefore I can only feel proud to discuss his latest full-length, Flashmob, on BBBD. Vitalic made waves in 2005 with OK Cowboy, a mesmerizing, woozy addition to the growing trope of techno-aggrandizing styles that were rapidly sprouting up in the early 2000s. "My Friend Dario"―a thrashing electro-pop gem of epic proportions―was the hit but I enjoyed tunes like "Polkamatic" more for their off-kilter, creepy vibe. The best songs on OK Cowboy posed to be theme songs to a Tim Burton horror/freak show that never happened. 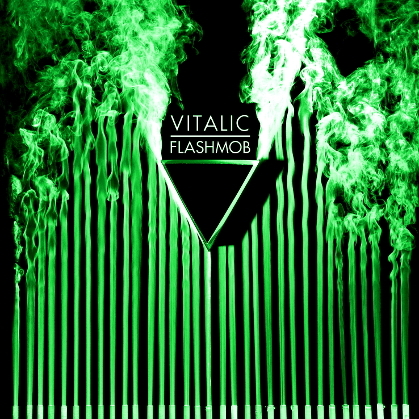 Four years after Cowboy, Vitalic is back with Flashmob, an LP that starts heavy-handed and never lets up. The producer's penchant for scaring the hell out of his listeners while simultaneously hypnotizing them into spasming on the dance floor is still there but now it's been amped up yet another notch. Flashmob feels incredibly frantic: Listening to it is, at points, like trying to keep up with a friend on the fritz who monologues to you in a panic, failing to take a breath through the whole ordeal. My appreciation for the songs on Flashmob aside, I don't suggest you listen to the thing all at once, and whatever you do, don't put it on while doing something that requires focus and calm (i.e. driving, working at your job). You've read the disclaimer, now download these jams! Psst, Vitalic is french. Very french actually. And, well, a bit boring.